This is not a new recording - it was recorded in 2001. These performances have been available before as part of a Brilliant Classics two-fer (review) I could not resist visiting it since it had slipped my notice when it first appeared. 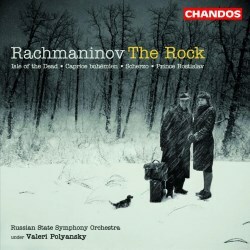 The Rock is one of my favourite Rachmaninov compositions. I was immediately captivated by its vivacity, its driven rhythms and Late Romantic passion when I first heard it on the venerable 1976 Andre Previn recording. The Rock was a fill-up on that album which majored on Rachmaninov’s Symphony No. 3. In this reviewer’s estimation, Previn’s recording of The Rock remains outstanding to this day. I was immediately intrigued by the fact that this album is called The Rock. Notice this album’s artwork and its emphasis on The Rock. Polyansky drew some very positive notices for his Chandos Glazanov cycle and this mainly early Rachmaninov collection, with the eminent Russian State Symphony Orchestra, is very impressive in terms of its broodingly romantic performances and the excellent Chandos sound engineering which so vividly captures the ruminating atmosphere of these symphonic poems. Rachmaninov’s score for The Rock was headed by a quotation (‘The little golden cloud slept on the breast of the giant rock’) from a Lermontov poem of the same name and one could infer that the whole work might suggest a scenario in which a little cloud reposes peacefully against a mountain top only to be disturbed in a storm, to return to rest only when the turbulence ceases. Yet Chekhov’s short story On the Road would seem to have been the real inspiration for this Rachmaninov composition. Chekhov had written of a man past his youth reminiscing over his tempestuous life to an unimpressed and unconcerned young woman he has met at an inn. But the revelation for me has been the inclusion of Prince Rostislav, considered by the writer of this album’s notes, Philip Taylor, to be ‘…in many ways the finest of Rachmaninov’s student works and which shows the young composer’s undoubted gift as a melodist.’ Briefly, its story is of Prince Rostislav drowning in a river in full flood and lying in its depth clad in full armour. The ‘beauties’ – the spirits of the river - ‘exchange kisses with him and comb his hair with their golden comb.’ Rachmaninov traces this fanciful narrative with dramatic, highly evocative music. The better-known Caprice bohémien (or Capriccio on Gypsy Themes) receives a high-spirited and vivacious recording here. The addition of the rarely heard, brief Scherzo in D minor is also welcome. Finally, there is Polyansky’s interpretation of The Isle of the Dead and a very impressive reading it is too, with the Russian State Symphony Orchestra superlatively expressive. The oppressive atmosphere is well caught as the oarsman steers his corpse-laden boat towards the dark, towering edifice that is the Isle of Böcklin’s picture. The music soars ecstatically to its emotional climax, only to be harshly brutalised before collapsing back to the allusion of the progress of the boat and to the closing, fatalistic Dies Irae. I cannot recommend this album too highly to all Rachmaninov devotees.